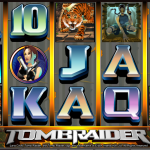 Lara Croft is once again at the center of attention, this time on the reels of the Microgaming slot Tomb Raider. That’s right; it’s time for new adventures as Lara Croft takes on the online gambling industry. This is a very popular game thanks to the previous success this title had as a PC game and a blockbuster movie. This slot is based on the PC version, while the movie came much later to the big screen. The slot has great symbol details and decent animations considering its relatively old age. The wild symbol in the game is the Tomb Raider Logo and he can land on all reels. He will substitute for all of the symbols except for the scatter and the bonus symbol. The wild comes with a maximum payout of 7.500 coins for 5 of a kind wins. The Bonus symbol in the game triggers the Tomb Bonus if 3, 4 or 5 of them land on a pay line. In this feature you will need to make picks among golden statues and each one will award a coin prize. The maximum payout in this feature is 1.500, 2.000 and 2.500 coins if the bonus was triggered with 3, 4 or 5 symbols. 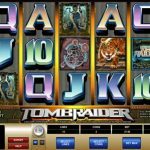 Tomb Raider also has a free spins bonus which is triggered with 3, 4 or 5 scatters anywhere on the reels. The maximum payout for the scatter symbols is set at 400 x stake. The player will be awarded with 10 free spins where all payouts will be tripled in size. The feature in Tomb Raider can be re-triggered with 3 or more scatters on the screen. 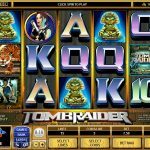 When Tomb Raider came online across Microgaming casinos it instantly became a big hit. The game has a rich pay table and attractive bonus features which can produce nice payouts. This is reason enough to give Tomb Raider a try for real play. The next one you should play only for its awesome name! Tiger Vs Bear a 5 reel slot by MicroGaming.